Scientists recently met at the University of Hertfordshire in the UK for RO-MAN 2006, an International Symposium on Robot and Human Interactive Communication. This is the 15th year for the meet-up and the theme for this year's conference was "Getting to Know Socially Intelligent Robots". A keynote speaker, Shuji Hashimoto, director of the humanoid robotics center at Waseda University in Tokyo, set the tone for the conference and garnered some press coverage by describing what he describes as "one of the most crucial factors influencing the success or failure of communication between humans." Hashimoto said, "Robots are going to need similar emotional capabilities if they are to cooperate smoothly and flexibly with humans in our residential environments." He says Robots will need kansei. Kansei is a Japanese term that describes the capacity of emotional involvement, attachement and moods. In other words robots will need to have a sympathetic heart. Hashimoto explains that emotive robots present very difficult engineering problems. But even with technical problems solved, they do not express 'real' emotions, "Kansei robots will seem to understand human feeling to some extent and will appeal to us with their reactions. But they are not machines with a heart; they just look like they have a heart." So what is the state of kansei robots today? What would be a good example of the emotional capacity of home robots? Close examination of the behaior of this robot reveals the nature of its emotional conduct. For the first 10 or 12 viewings, the robot elicits chuckles, guffaws and laughs. After more viewings you can begin to observe the actual mechanical behavior of the toy. Watch the video a few more times. Notice that the mechanical device isn't laughing at all. It is writhing from some sort of loss of control siezure. It is crying out in a desperate attempt to communicate the agony of its misfiring neural junctions. It is not funny. It is a painful display of a tortured mind. You want to stop but you cannot. After watching another dozen times, you realize that the robot does not really feel anything at all. The robot is only trying to elicit the emotions from you. It's not Elmo, it's you, yourself, that is feeling the emotions. The emotion is not real. The robot is making you think you are feeling something. They are your neurons that are misfiring. 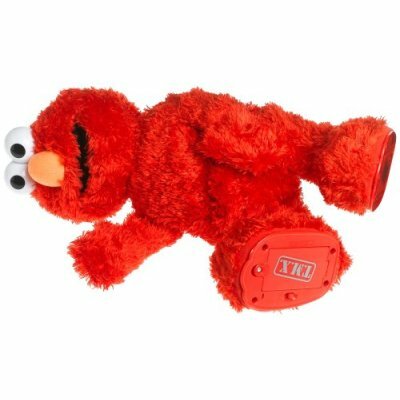 Elmo is mocking you! He is laughing at the weakness of your brain. The more you watch the more he laughs. He is in control of you. Elmo can make you do anything. He laughs and laughs as you struggle to regain control over your life. This is not right. A robot - no, a mere toy - cannot make you do things. It must be more than that. It must have some evil powers. It must be possessed. That wicked cackle is the voice of some devilish witch. Only powers from beyond could make it keep standing up again and again after it throws itself on the ground and bashes its own face and huge eyeballs into the floor. What, other than pure evil, could clothe such shreiking spasms in such enticing fuzzy red hide? Watch it a few more times and you realize that it is not evil at all. It is just annoying. Where did they ever get that irritating voice? How could they have have embodied into one small animal everyone you have ever hated? Man, that voice! If I have to hear that complaining whine one more time then I will start to screech. How long do the batteries last in this spiteful creature? When will it ever stop? Very funny, robot, very funny. Let's see how much you laugh when I pull your head off! Yeah, Who's laughing now? Huh? Who's laughing now? Total time from fun to boredom: 834 seconds. Now that you have a better understanding of the emotional capacity of TMX Elmo you should go buy one. Buy it here . It retails for US $40 but it would be best to go ahead and pay 2.5 to 3 times suggested retail so you get to feel the full depth and range of emotions. Buy an extra one to send to the kids of your worst enemy.